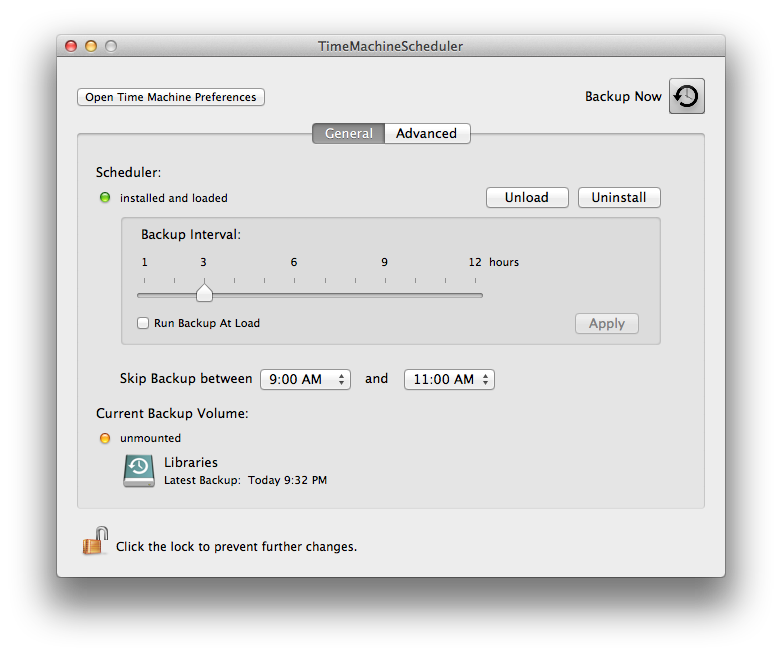 In macOS 10.5 Leopard Apple has introduced Time Machine, a very convenient way to make backups. Unfortunately the backup interval is preset constantly to one hour. Apple uses an launchd daemon to control the timing, but changing the interval value in the launchd.plist file has no effect. TimeMachineScheduler disables the automatic backup function of Time Machine (the big slider) and installs its own launchd daemon. As the daemon is located in the main library, the administrator password is required for all (writing) operations. Except disabling Time Machine no further system files and preferences will be touched by TimeMachineScheduler. There are (still) some access privileges problems in OS X 10.5 Leopard, if the operation system has been updated, migrated or installed with the archive & install option. TimeMachineScheduler takes care of all files and sets owner, group and the privileges to the proper default value. You can install and uninstall the daemon as well as only load and unload it to disable making backups temporarily. The interval can be set between 1 and 12 hours, and the daemon can be set to run additionally at load, which means also at startup and login. You can press a button to run a backup immediately. The status of the scheduler will be displayed. The Apply button affects only the settings interval and run at load, which are part of the launchd daemon. All other settings are applied immediately. While a backup is running the control elements are disabled and all actions will be written into a log file (/Library/Logs/TimeMachineScheduler.log). If you want to revert to the original settings of Time Machine, just uninstall the scheduler and enable Time Machine in its Preference Pane. In version 3 the application is turned into a Preference Pane. A simple installer is added to update older versions, install the Preference Pane or completely remove all components of TimeMachineScheduler. Version 3.1 is compatible with macOS 10.7 Lion. Version 3.1.4 is compatible with macOS 10.8 Mountain Lion. • Set the interval from 1 to 12 hours. • Automount, an option to mount and unmount the backup volume automatically (see known problems). • Option to hide the backup volume (to take effect a Finder relaunch is required). • Option to restrict backups to a defined network connection (WiFi/Ethernet) and over WiFi to a certain SSID. • Option to skip the backup within a specified time range. • As TimeMachineScheduler works independent from the Time Machine Preferences, some information might be displayed wrong in the Preference Pane of Time Machine. • It could happen, that the backup volume cannot be unmounted (using the automount feature). This occurs also, if the application of TimeMachineScheduler is running. However the daemon is not affected. TimeMachineScheduler 4.0 is turned back to a standard application because of Apple's security restrictions for Preference Panes (no offense, Apple). The application is not required to run permanently. Drag the application onto the Applications Folder alias in the disk image. It's strongly recommended to leave the application in the standard Applications folder. On first launch TMS asks to migrate the existing data and to delete the Preference Pane of version 3. TMS asks also for permission to install the privileged helper tool (that's not really new). The UI is slightly more clearly arranged. The "Backup Now" button provides an animation similar to the menu bar animation. The red border indicates the active backup process. For security reasons the Backup Now button is disabled until the backup process exits (approx. 2 min after the backup is completed). An additional wake watchdog. When the computer wakes up and the time of the latest backup is earlier than the interval setting, a backup is started. An option to run AppleScripts before and after the backup to specify a custom condition and proceed the result (see the descriptions in the pop up views). Better disk management. The unique parameters of the backup volume are saved so the validation by mounting shared and local volumes is not needed anymore. Multiple SSID (name of wireless networks) values. Support for multiple backup volumes added (10.8 and higher). The current backup volume in the General view shows the volume corresponding to the Time Machine menu bar item. The network condition and automount / invisible parameters can be set separately for each volume. Time range and script settings are global. The automount checkbox is enabled when the backup volume is available. The invisible checkbox is enabled when the backup volume is mounted. After changing the visible status the Finder is supposed to be relaunched. Like the original behavior of Time Machine the scheduler rotates that means it looks for the next available backup volume considering the custom conditions. The TMS beta is not localized yet. This Beta version logs a lot of stuff in its log file (/Library/Logs/TimeMachineScheduler.log) as well as in the system log file. Please test this version and report issues with crash reports and/or log excerpts to stefan@klieme.com. Important Note: TimeMachineScheduler does not touch the contents of the backup volume at all. The worst case is no backups will be executed. 64 bit Mac and macOS 10.7 Lion and higher including macOS 10.12 Sierra. The application is code-signed. • A local volume with automount enabled will be unmounted at a reliable point in time to avoid thinning backups error. • The outhook script is run at the same time. • A new state is added for the outhook script in case the backup is cancelled by the user. • If the localized disk image volume name in Time Machine preferences is not defined the default name "Time Machine Backups" is used. • Considers now local backup volumes formatted with HFS+ journaled encrypted. • Avoids a crash and displays an error message while changing the volume preferences for a backup volume which was recently assigned in Time Machine preferences before running the first backup. • Fixes a bug to recognize shared hosts containing special characters. • The deamon settings (interval and run at load) are disabled now while the backup process is running. • Many other fixes and optimizations. • Fixed a fatal bug which caused the application to hang while detecting network volumes. • The name of the current backup volume won't be truncated. • Improved method to detect the availability of shared hosts containing the backup volume to avoid error messages. • TimeMachineScheduler notifies in Notification Center about the state after pressing "Backup Now". • Fixes a sporadic crash right before quitting the application. • Support for multiple backup volumes added. • Displays the date of the latest backup for all volumes. • Time range / time zone issue fixed. • Many small improvements and fixes. • Sparkle Framework for automatic updates added. • Prevents the app from crashing in case the field Computer Name in System Preferences > Sharing is empty. • New Features and Changes see notes above. • TMS will no longer crash if the computer name (in Sharing) is empty. • Considers the "Require AC Power" setting of Time Machine. • Avoids to search for the shared backup volume within the "Skip Backup" range. • Fixed a bug to gather the proper SSID name in Lion. • Compatible with macOS 10.7 Lion. • Feature added to restrict backups to a defined network connection (WiFi/Ethernet). • TimeMachineScheduler 3.1 runs only on Intel computers. • fixed a bug in the french localization. • Considers the naming convention of the mounted sparse image in both Leopard and Snow Leopard. • TMS will no longer crash while authenticating the helper tool. • Considers the new naming convention of the sparse image in Snow Leopard. • Fixed a bug in the installer applet. • Problem fixed, that the backup volume won't be unmounted automatically. Time Machine is a part of macOS 10.5 Leopard by Apple Inc.
Time Capsule and Airport Extreme are registered trademarks of Apple Inc.